James Marsh’s sublime documentary – a heady mix of archival footage, seamless re-creations, heist-film editing, superb score, and lively talking-head interviews – is a giddy joy of a film. The effusive Gallic charm of high-wire artist Phillippe Petit lifts it beyond the staid, earth-bound confines of most docs, and imbues it with a playful beauty. Petit made his name with a series of guerrilla wire-walkings in the early 1970s, wherein he and his band of mischievous bohemian collaborators steal into lofty premises and set up the tightrope without being noticed before Petit is loosed on his unique public stage. Though he never details his motives for springing these sorts of high-wire acts on the public rather than getting proper official approval, it’s evident that Petit enjoys the performance-art spontaneity of the surprise for his impromptu audiences, as well as the convenience of bypass the considerable insurance and safety hurdles that would doubtlessly accompany official sanction. These circus capers began with Paris’ Notre Dame Cathedral before Petit moved on to the more ambitious crossing of the towers of the Sydney Tower Bridge. Usually the authorities perform their duty and arrest Petit when he comes down from his artistic perch in the sky (wherever he is, he’s breaking some law or other), but charges are rarely forthcoming. The beguiling daring of his high-wire enterprises overwhelm laws and bureaucracy as well as the basest cynicism. They are, in a word, magical. None of them managed to be more magical than his spanning of and performing in the gap between the twin towers of the World Trade Center in New York City in August 1974, then newly-opened and the tallest buildings in the world. Petit and his team’s ballsy plan to carry off the surprise performance is the focus of Marsh’s film. A celebrated story at the time, Petit’s act has gained added resonance since 9/11 deprived the world of his ultimate high-wire muses. Rather smartly, Marsh allows no mention of the disaster in the text of the film itself. It celebrates instead the first moment that the forbidding behemoths of steel and concrete became symbols of something more transcendent, without clouding that transcendence with the last moments that they became symbols of something much more sinister. Man on Wire‘s silence on the cataclysm that made a repeat of Petit’s feat impossible is completely fair: this is not a mournful film, but a celebratory one. It remembers fondly, but does not grieve; it’s a wake rather than a dour funeral. But its silence relies on a sharp, tragic knowledge of the ultimate fate of Phillippe Petit’s greatest high-wire stage to deepen its pathos. Man on Wire provides no eulogy for the World Trade Center; it’s more of a happy anecdote of finer days, told in the after-service glow of alcohol and kindly reminiscence. 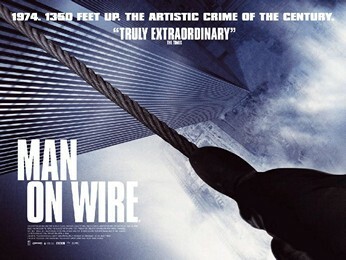 Marsh and Petit realize that the wire walk is not how the buildings will ultimately be remembered, as darker forces have asserted themselves on that particular segment of memory. But it’s how they wish to remember the buildings, and their documentary is persuasive enough to make us want to remember them that way as well.